We’ve got two screenshots for you, which show our new 9M block TDD building looking all nice and intact–one image just before those nasty Arthurian weapons hit as they seek to evict the TDD from one of their ancestral keeps, and another image taken while the destruction is taking place. Mark chose this second shot because you can see some of the effects of destruction, as well the areas of the walls that are becoming unstable due to the damage the Arthurians are doing. At the end of the scenario, the owners of the castle are going to need a lot of screen doors! And now, more good news! We are planning on having a test this weekend. Check the info below. More info will follow, as usual, in a separate email. If you missed today’s livestream update and Q&A with Mark (and guest appearance by Chad from Town State Leisure) you can find that HERE. WIP – Art/Tech/Design – New Siege Scenario: Have you SEEN the size of that castle? At over 9 million blocks, we are certainly stress testing things! But wait, there’s more! This week, we continued work on the new siege scenario, adding in over seven hundred NPCs, a field of trebuchets, magic mortars, and scorpions, all firing at and from the castle! Several of us exploded with giddy laughter as we saw this all come together! Tyler and team continued to work on the map, while Ben set up all the aforementioned NPC spawners and siege engines. As the week has progressed, our focus has moved to addressing performance and resolving multiple related bugs. WIP – Tech – Improved Ability System: We’ve talked a lot about the ability updates, and we have been busy fixing bugs, balancing, and working on the user experience for the ability system. You can already craft your own abilities during our playtests. We’re continuing to add in more parts, hook up or fix the FX and animations, and overall, continuing to fill out the components for the existing classes, including the mages. WIP – Tech – BPOs (Building Placed Objects): This week, Matt and Colin did a lot of work toward delivering a strong first experience with placeable objects in buildings. One of our newer developers even delivered the ability to have animated objects and placeables in buildings–woo hoo! Our first test asset is an animated banner to go atop the castle walls in the new siege scenario. Design/Art – Siege Engines: As some of the IT Backers may have noticed, we’ve added a new siege engine type, the Magic Mortar! This week we polished up the FX for the magic mortar and all of the siege engines, worked on LODs for the magic mortars, and made some small bug fixes. dB is also using the new scenario with lots of siege engines firing to work on the audio mix. 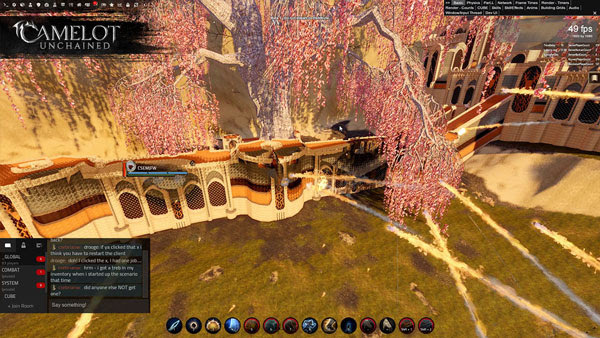 Tech – NPC Behavior: Speaking of Siege, we’ve also made some improvements to NPCs related to sieges. We made our NPCs a bit smarter about reloading siege engines, and now they can target the bricks of a building. Based on our internal testing, they are quite good at their job! Tech – Health Bars: This week, JB was able to update the health bars to properly display wounds on the UI and made the health bars show as 3 segments (for now), which matches the current wounds implementation. WIP – Art – Character LODs: Dionne, Joe, and Tyler continued adding in more artist-created LODs this week to improve performance. Dionne worked on the Autumn armor set, finishing three of the four LODs needed so players can craft the autumn armor and not look like squids! (Sorry, Cthulhu.) As we come down to the end of the first pass of this work, we’ll begin a second pass to look for further reductions, as well as final cleanup and weighting polish. 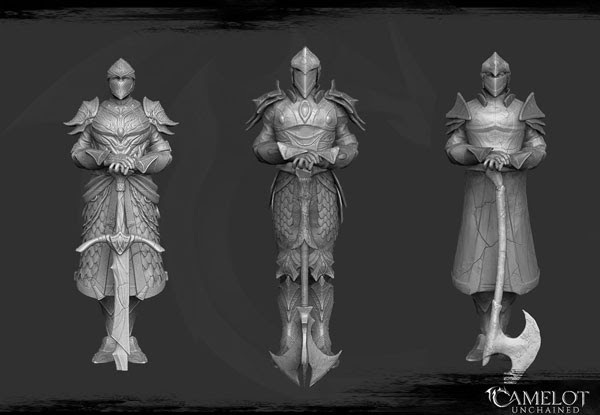 This work will first focus on our NPCs used in our new siege map as well as the new mage outfits! 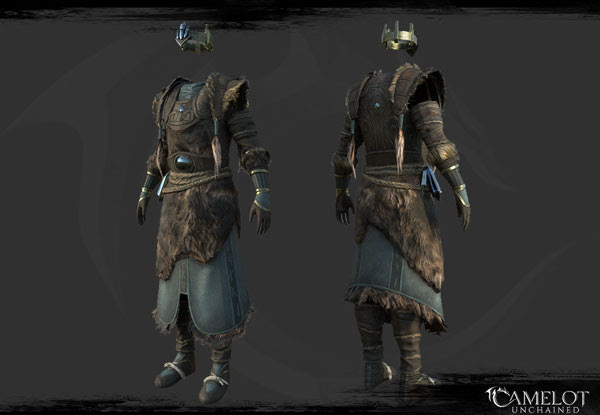 WIP – Art – Mage Outfits: Speaking of which, Jon finished the last outfit, the Viking model. The next step will be to add it to the character LODs to do list, add weighting to it, and get it in for testing! Art – Environment: Jon made two new TDD statues for our new scenario, and Tyler continues work adding in more rocks, better-looking grass setup, etc, as we continue to not only make the scenario look better, but also work to improve performance where necessary. Magic Mortar Animations: Scott focused on getting the magic mortar animations hooked up on the Human and Luchorpán skeletons. Mage Animations for Luchorpán: The Luchorpán now have their own animation for the magic mortars, retargeted off the humans. 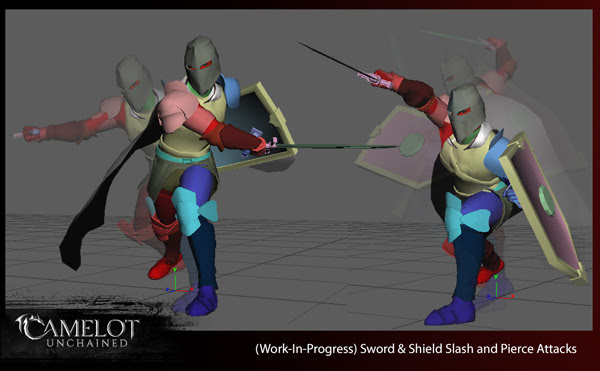 Shared Sword and Shield Combat: Scott added skirt and cape animations to our various sword and shield combination animations. Improved Archer Movement: Now that we are no longer technically beholden to matching our idle poses when our characters move, Sandra went in and loosened up the Forest Stalker and Blackguard’s movement animations. WIP – Character Texture Warping Fix: After a bit of digging, Jon figured out that the software we use to author our textures was triangulating our character meshes. What this means is, once the textures were applied to our models, they had a bunch of small “jitters” or “warps,” which were noticeable on close inspection. This is a quick fix, and should be finished early next week. 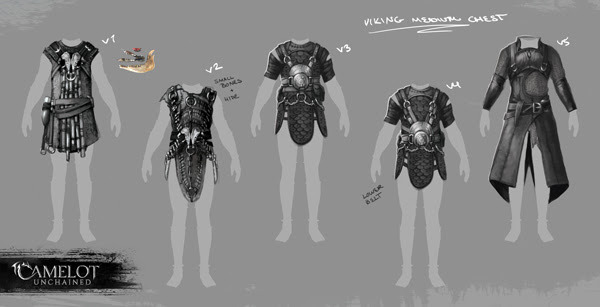 Art – Armor Concepts: If you’ve seen our last couple of updates, we’ve had a looot of new concept art for new armor. And that’s just the ones we’ve shown in the updates! As usual, there’s lots more! Once we update the existing gear to work with the crafting and tinting system, we’ll begin choosing new gear from this work to concept. This week, we focused on Arthurian and Viking medium armor, creating several pages of possible gear. For art this week, we start off with the material pass of the Viking Mage armor we’ve made, initially for testing the new classes out. This outfit was based off some of the current gear we have to save time getting it into the game. Jon did a really great job making it very different from where we started! You can see the previously-made TDD and Arthurian versions HERE and HERE, respectively. In our new siege scenario map, we have several very large TDD-themed statues along the cliff’s edge of the battlefield. Jon created two more versions, which I, Tyler, will set up and import to add more variation. Our animators remain busy as ever. Here’s a couple of shots of some of the work Scott is doing with the one-handed sword and shield animations. When time allows, we’ll get back to uploading more animation videos. Or instead of watching that, you could jump into one of our future tests to try out these characters yourselves! This animation is part of the next push for animations that will support shared combat animations between classes, allowing anyone to pick up one of the game’s weapons without us having to author unique animations per class! Next up, we have some really cool new concepts. First, Viking medium chest armor. Remember folks, these are still just concepts, so expect things to change as we hone in on new assets to make. And here’s a few Arthurian concepts. As you can see, it’s important we make sure that the Realms are visually distinct, lending not only to the world and its lore, but also clarity on the battlefield! I’m very excited to get to the armor and weapon work needed to further support the crafting system. 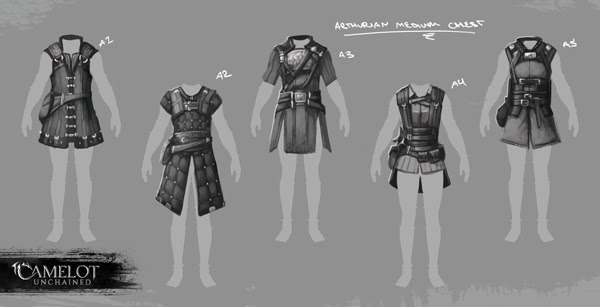 We’ll be updating our existing armor assets so that the materials you choose to craft with will show up on the armor. For example, if you use dragon skin instead of cow hide, you’ll see a different material in the corresponding region of the armor. Additionally, we’ll be working on tinting, where we define regions of the gear that players can tint with colors of their choosing. The same will be done for the weapons; but we also have plans to create weapons out of parts, meaning you can select the pommel, grip/guard, and blade independently. Lots of cool new challenges for art! That’s all for this week’s update, folks. As Mark spoke of above, we’ve continued to press onward, pushing the envelope on what our engine can do…and as he says, there’s more to come!